Today, 3rd April 2017, a number of bus service changes are taking place in Pembrokeshire. Actually, First Cymru’s new timetable booklet is dated as running from 2nd April (yesterday), but since the Sunday bus network is a woeful ‘nothing at all’ the effective date is today. When this post is published however, I will not be in Wales. Today, I’m returning from Norwich on one of my railway exploration holidays, so I planned ahead. On Friday 24th March, it happened that my father wasn’t coming into work so I went by bus. With the new timetable coming up, I decided to take a camera to get pictures for this post; and a story developed. The first leg of my journey was uneventful. I reached Haverfordwest as planned and waited for my next bus, which I photographed; the 349 service to Monkton, calling at Picton Place, County Library, Dew Street, Horsefair (Tesco), Merlin’s Bridge, Johnston, Honeyborough Roundabout, Cleddau Bridge, Pembroke Dock, Pembroke and Monkton. To me, this was the ‘349b’ service, although First referred to it simply as ‘349’. The first five places listed were reached without mishap, but by the time we reached Johnston an alarm had sounded on the bus. The driver pulled over and cut the engine; after a short wait he restarted it and we continued. Not for long though; the alarm soon returned and we were parked in a lay-by-type bus stop in Johnston. The driver phoned ‘the engineer’, stating that the alarm had been accompanied by loss-of-power. We waited until the engineer turned up; I was hoping they would send a replacement bus (as Richards Bros have done once or twice when I’ve been on one of their services that suffers a breakdown) but it was just a van. Although an annoying delay to my journey, which made me even later for work (as I pointed out to a fellow passenger who asked, I’m ‘late’ for work anyway whenever I go by bus), the failure gave me the opportunity to collect additional photographs which I would have otherwise been unable to obtain, and are preferable to the rather dull picture I took back at Haverfordwest bus station. With no replacement bus provided, we were instead forced to wait for the next service, due to leave Haverfordwest half-an-hour behind our failed bus. 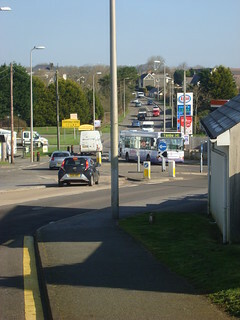 We had already spent almost that long stationary, so it wasn’t long before the second bus arrived; the ‘349’ to Tenby. To me, this was the ‘349a’. The driver from the failed bus told the other driver that nobody was trying to get to Monkton, which the ‘349a’ does not serve; and off we went leaving the engineer, the stricken bus and its driver behind. It wouldn’t be the last we saw of them. The reason I have my own ‘349a’ and ‘349b’ designations for these services will now become clear (although, if you’ve read my 3-part 2016 series on bus route numbers, you might guess where I’m going with this). It is also why I had hoped a spare bus would be found. At the Honeyborough roundabout, our ‘349a’ turned right, rather than heading straight-on to the bus stop as the ‘349b’ would have done. These are clearly different routes, which is not what First (by calling both ‘349’) would have had you believe. 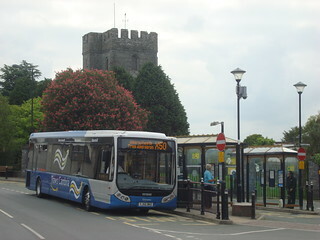 The right turn takes the 349(a) into Neyland, which is not served by the Haverfordwest-Monkton service. 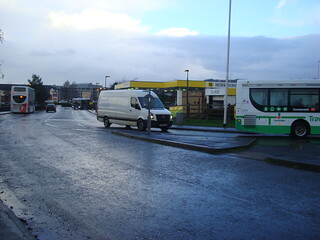 After looping round Neyland, we came to the Honeyborough roundabout again; this time heading out to the bus stop. Lo-and-behold, sitting there was our errant ‘349b’, with engineer’s van. By not going via Neyland, it had overtaken us but had obviously failed again so I was no later into work than if I had stayed with it. With the story (almost) complete, I finally get to the news. 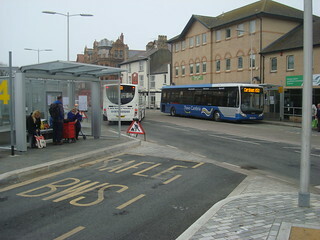 Haverfordwest bus station is to see a reduction in services, with outward services to Milford Haven (302), Johnston (the Tenby and Monkton services discussed above) running direct from Withybush Hospital to Picton Place (Iceland), missing out the bus station. 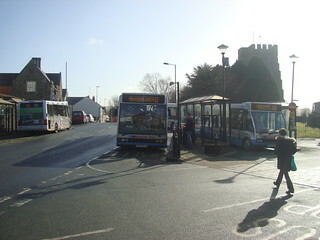 The bus station is still served in the other direction, heading towards Withybush Hospital, with the Monkton services extended there rather than terminating at the bus station. First’s information might lead some to believe that Pembrokeshire is suffering a major bus cut, since they describe the 381 service (Haverfordwest-Tenby via Narberth and Kilgetty) as being ‘cancelled’, with the last day of operation being Friday 31st March. 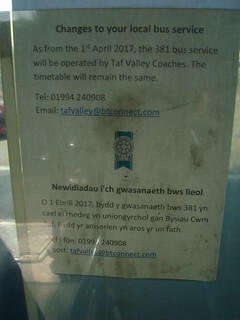 In reality, that service has been taken over by Taf Valley Coaches, as the Pembrokeshire County Council notice on the First buses I took in the story states. 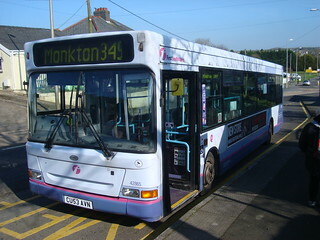 The headline however is that, from today, I will no longer have to call the two ‘349’ routes ‘a’ and ‘b’, because the direct Monkton service will now be known as the 348, while the original 349 (via Neyland to Tenby) remains the 349. A little victory for me (I probably can’t claim any credit for it, but it feels good anyway); now how about bringing back the 550, 50 and 412 designations and sorting out that colossal amalgamation which is the TrawsCymru T5? Going back to the story, given the huge delay to the ‘349b’ service I was concerned that the service might not recover punctuality all day, jeopardising my ‘connection’ on the return journey. Somehow (perhaps by cancelling a trip?) it seems First did get the ‘349b’ running on-time again (or reasonably close to it), because my journey home went smoothly. In the third (and hopefully final) part of my series on blanket route numbering of bus services, I present proposals for sorting out the problems described previously. With the above, for example, passengers from Aberporth to Penparc would have a clear choice of 550 or 554, they would know the 552 goes via Gwbert and is not for them. 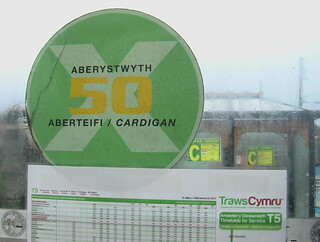 People bound for Gwbert from Cardigan would know they need a 552, and passengers for Aberporth would be able to see ’50’, ‘X50’ or ‘TC5’/’T5’ and know they needed to wait for a 550, 552 or 554. There are probably many more examples of the improved clarity this would bring. Admittedly Llangrannog’s once-weekly fast(ish) service to Cardigan would have to become a normal slow service via all the beaches, but nobody with a choice of mode is going to rely on such an infrequent service. 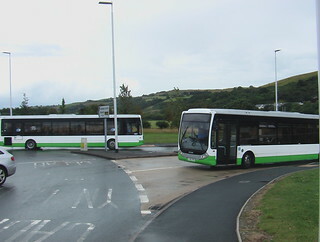 Also, the one journey between Beulah and Cardigan via Gwbert would be re-routed via Penparc, meaning Beulah-Gwbert journeys would always require a change of bus, but that’s not likely to be a popular flow and an extra 552 (probably a short working between Cardigan and Aberporth/Tresaith) should be put in to maintain service levels at Gwbert. The above is just to show it should be possible to solve the problem, but how to avoid the creation of blanket service numbers in the first place? I don’t think a hard-and-fast rule is possible, since an application of common sense is required. For example, there are two different routes that buses may take through Penparc, and some buses detour via Aberaeron school. I made the decision that the routes are not significantly different, with all points being within walking distance of the main route. Essentially, there needs to be a basic guideline but with a single mind to make a personal judgment. The person best placed to do this would probably be the Traffic Commissioner for each area. 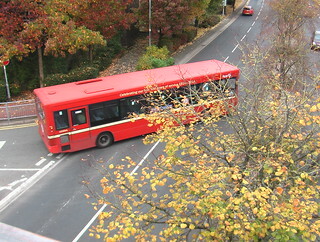 Bus services must be registered with the Traffic Commissioner, so they could be responsible for judging whether routes are significantly different, and preventing registration of services which would lead to a settlement being served by more than one ‘significantly different’ route with the same number. If they receive a registration which conflicts with this policy, they would instruct the operator(s) concerned to use a different number (or numbers). What are service numbers for? Earlier this month, I criticised the TrawsCymru T5 for having a blanket service number covering at least six different routes. As I alluded to at the time, it isn’t just the T5 that makes the number on the front of the bus (often displayed on the side and rear too) seem pointless. 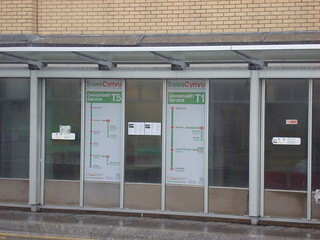 Lies: the TrawsCymru T1 and T5 shown as single routes on bus stop branding. Remember, I’m not suggesting that a wide range of routes is necessarily a bad thing, just the practice of giving multiple routes the same service number. In the case of the above, one route should be picked for the TrawsCymru designation to avoid cluttering the TrawsCymru numbering convention. The others should continue as ordinary local bus routes. I don’t know the answer to the question posed by the title of this post, but I would have thought the purpose of a route number is to identify the route a bus will take to reach the final destination displayed on the front of the bus (often on the side too). A blanket service number as used by the above TrawsCymru services doesn’t do that. Examples of the confusion the blanket numbers can cause were given in the earlier post, and the practice isn’t limited to TrawsCymru. 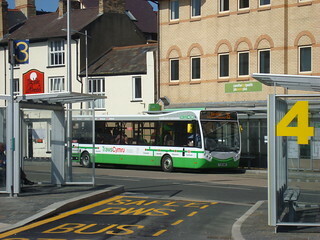 A long-running First Cymru service in south Pembrokeshire is the 349 between Haverfordwest and Tenby via Neyland, Pembroke Dock, Pembroke, Manorbier, and Penally. Apart from one early-morning service omitting Neyland and Pembroke Dock (probably just a positioning move) it was a single route. However, on the 3rd January (2016) First changed all that. 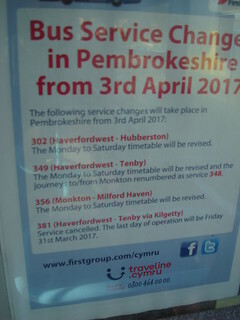 They cancelled another of their routes (the 355) and introduced a new route, Monkton to Haverfordwest via Pembroke and Pembroke Dock. 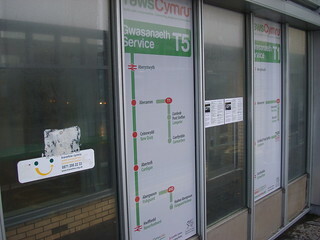 Thus, it provides a faster service between Pembroke and Haverfordwest, by avoiding Neyland. 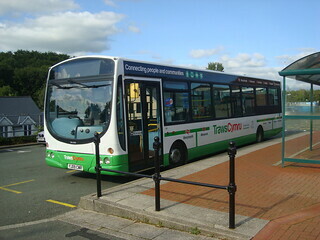 The problem is that this new route has been given the same service number as the Tenby service (ie. 349). I believe the 349 (and the now-cancelled 355) are commercial ventures on the part of First, and TrawsCymru services are of course specified by the Welsh Government, at least in part. Local-authority specified services aren’t immune either though, heading north out of Cardigan there is another mess. 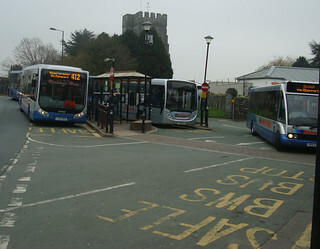 Bus route maze: a range of services preparing to leave Cardigan, including the inconsistently routed 552 service. As I may have mentioned last time, the residual ‘X50’ services between Aberaeron and Cardigan, despite making only three trips, manages to cover all three main routes (direct, via New Quay, and via New Quay and Aberporth). 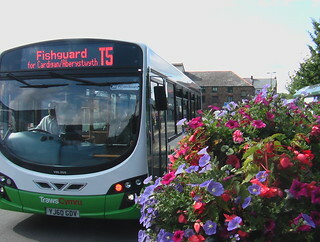 There’s also the 554 (to Beulah, usually) and 552 (coastal routes to New Quay) services. 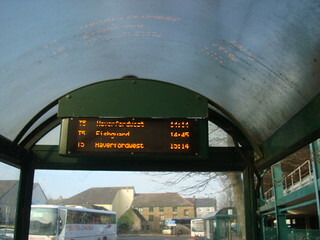 The 552 varies its route depending on what day of the week it is. It used to have two trips as far as Llangrannog on Tuesdays & Fridays, one via Aberporth and the other via Bleanporth and Brynhoffnant. It ran through to New Quay just once a week, on Wednesdays. Some of the five workings each week served Llangoedmor, others didn’t etc. Now, the service is known as the Cardi Bach* and the short workings to Llangrannog (still via Brynhoffnant and Blaenporth vice Aberporth on one of the two trips) are Thursdays only. Via where, exactly? 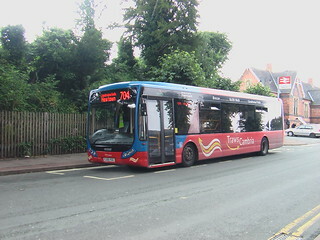 The 412 might be displaying ‘via Fishguard’ but the 412 always did that, was this particular working going via Trecwn? We can’t tell. 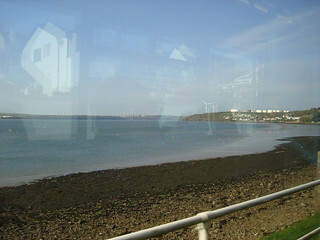 Likewise the 554, Beulah via Aberporth yes, but via Gwbert too? Use meaningful route numbers, please. The rest of the week** the service basically follows the old service 600 Cardi Bach timetable, travelling via Gwbert and Mwnt (the old 552 travelled via Penparc, as does the current Thursday service) and several beaches not otherwise served. 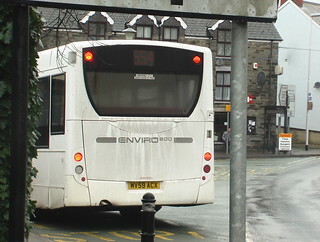 Like the 552, the 554 also apparently cannot make up its mind whether to serve Penparc or Gwbert. 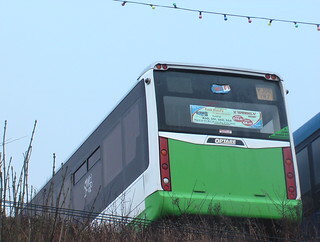 The full length workings (Cardigan – Beulah) on the 554 go via Tresaith (another place that is served by some 552s but not all), but some short workings don’t and one of these is done in a circular manner, taking in Bleanporth. This part of Ceredigion’s bus network is such a mess that I’ve probably failed to explain it cleanly. Hopefully my suggestion of how to tidy it up (coming in a future post), will be clearer.